Colors are well done, contrast is good. Brightness is at the high end of acceptability. The white on the horse's face appears just at the burn-out stage and is loosing texture and detail. Other than this, the lighting is well done. A brighter or more contrasting day would have left the left side of the horses face in shadow. There is just enough shadow to give texture to the picture, but not enough to distract. Nice touch. Focus appears sharp, but misplaced. A sahllow depth of field would be a good idea for this picture, but it appears that the focus was on the flowers and fence in front of the horse. The end result is that the horse looks soft. Had you gotten the horse more in the zone of focus I think you would have scored higher. Had you gotten the horse to reach over the fence, I think this would have helped also. 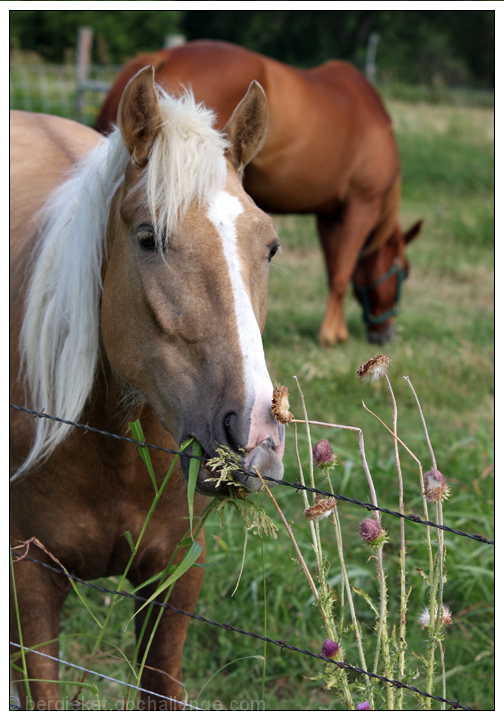 The barbed wire in front of the nose, and the grasses in front of the face tend to compete with the horse for attention. Cowboy related without the cowboy. Good scene. I'd like to see both of the horses together and without the barb wire fence being so prominent. "Why is the grass over here warm, and wet, and um... DAMN! You peed here didn't you?" I would have liked to see the foreground and the background horse separated by a little space in this shot, perhaps just a couple steps to your right. Some may say you should have cloned out the barbed wire (if that's legal?) but I'm fine with it in. Nice detail maintained in the highlights. This is ok as a photo. Feels a bit snapshotish IMO. Kind of like someone just walking up to some horses in a paddock and grabbing a quick shot or two. Appears that they were recently moved to this spot...I know our pair of horses would have that nice green grass knocked out in no time. :-) Good luck in the challenge. nice shot but just not really on target for this challenge. Proudly hosted by Sargasso Networks. Current Server Time: 04/24/2019 09:51:53 PM EDT.